GPS is the most interesting part for makers, with GPS, you can know where you are, or state the location of the object that you are tracking. 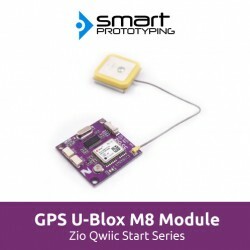 This is a high precision GPS module that includes a powerful NEO-M8N-0-10 module from u-blox. The NEO-M8N module is based on the u-blox M8 GNSS (GPS, GLONASS, BeiDou, QZSS, SBAS and Galileo-ready1) engine that provides high sensitivity and minimal acquisition times while maintaining low system power. We used a SC16IS752IPW to convert the module’s data from UART to I2C (Qwiic connectors), so that you can use Qwiic cable to quickly connect the GPS module to any other Qwiic devices. We also breakout the UART port to a 1.27mm terminal connector, just in case you want to use UART port directly. We’ve even included a rechargeable backup battery to help keep the latest module configuration and satellite data available for up to two weeks. This battery helps to ‘warm-start’ the module, decreasing the time-to-first-fix dramatically. It also features a survey-in mode allowing the module to become a base station and produce RTCM 3.x correction data (as opposed to the previous version of the module which is not able to produce RTCM data). We also offer you a tested GPS antenna for the module, you can just plug it into the IPX connector on the board. The antenna is required when you get it running. Note: The antenna needs to face towards the top.